Last week was my overbooked crazy frenzy of fun. Science Olympiad finished 12th and are done for the year, but my little Lego guys rocked. They took home the grand champion trophy and the prize for high score on the robot run. The egg shirts were adorable with the egg hats, and they went crazy with egg puns and snacks. So we have just one more week to get ready for the regional tournament in Jacksonville. We are all EGGcited about it. My AP class also went to Gainesville on our big overnight field trip this week. Such a fun time! We saw a basketball game, did two DNA labs and spent lots of time walking around exploring campus. All of that was slightly complicated by the fact that Kurt has been in India all week for work. He is on the way home now though, and we can't wait to see him again. There are still lots of odds and ends left in blue. I'm wondering what to do with this collection of blue crumb diamonds. I was thinking of stars? There are plenty of crumb blocks for later, but I was hoping to make some string blocks as well. This is a long month though, and there is still one more blue Saturday for finishing off all the leftovers. Sometimes the Saturdays just work out that way. How are your blue projects coming along? Use misterlinky below to share with us all. Gosh you've had a busy week! How did you ever manage to do any sewing? I got a bit squeezed in because my week what pretty busy too. Who says you'll have time for your projects when you retire?? Congratulations Angela on your team's success. I like the string block on the top of the pile: both regular and wonky. Incidentally The Blue Diamonds was the name of a Dutch singing duo! Love those little blue diamonds. I love your blue crumb diamonds! Are they on a paper foundation? Whatever you make with them is going to be awesome! Congratulations to your Lego team! That's an awesome win! Lots of pretty scraps in those diamonds. Stars would be very pretty out of those. Congrats to the EGGers . . . way to go!! And Congrats to the Science group, too. GREAT programs. Love your blue diamonds . . . gotta be a super way to use those! I for one am glad that January is such a long month- I have sososo much blue! where did it all come from? I've taken the time to go through all my scraps and leftovers from other (past) projects, and incorporate them into the blue scraps. I have several RSC projects that I'm going to work on this year. having fun so far! on another note: do you know that your RSC15 linky thing on the sidebar goes to the RSC tab, not your homepage? You are SO crazy busy!!! The crazy crumb blocks fit right in - tee hee... I don't like it when dh is gone long periods of time - glad yours in on his way home!! Enjoy! I'm liking your crumb blocks. 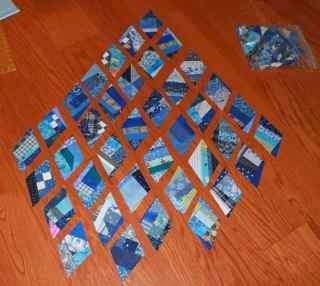 It seems I'm making more scraps the more blocks I make, lol. Will have to think of what to use them for. Still having fun with the blues. Can't believe that you found time to sew with your busy week! I'll keep trying... not sure WHAT the problem is. Thanks for linking me last week! OMG - you are a busy gal. And your RSC is doing such good work in the quilting world. I'm sure you are helping lots of us to see that color is where it's at... "Down with Brown" I say. I prefer the colors of flowers to the color of dirt. Thank you for all that you do for us. You have had a busy week! Good idea for the yellow team shirts. Love those blue crumb diamonds. Hats off to teachers (like you!) who are willing to go the extra mile with their kids! You really got a lot done to be so busy. congratulations! Eggcelent win! I think that is great. Nice blue diamonds too! Those little egg heads sure did you proud. Congratulations! Looks of scrappy goodness completed even with such a busy schedule. How do you do it? Joining in for the first time! Already looking forward to seeing what color is next. 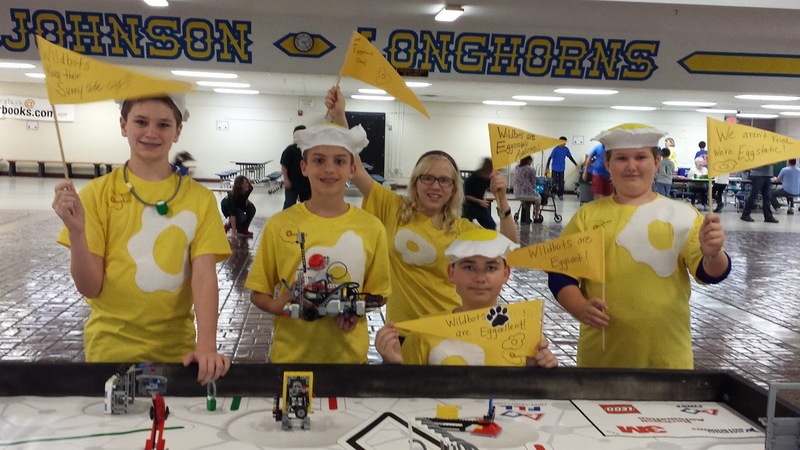 Go FLL team! Congratulations on your win! I coached and mentored FIRST teams for years and I know how all consuming it can be. 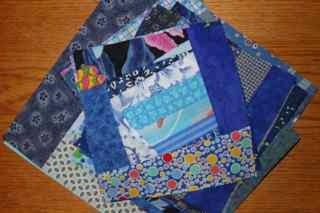 Congratulations, and good job on your quilting progress. I've had fun with my blue hexagons. I can't wait to see what the color is for February, but I really shouldn't put the blue to the side....I know I will though, just adding it to my growing list of UFO's. ScrapHappy Saturday -- Still Feeling Blue?